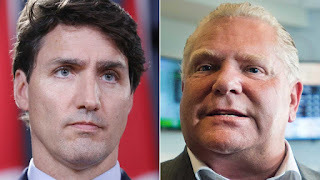 While it’s more the rule than the exception to have opposing parties in power at Queen’s Park and on Parliament Hill, relations between the Ford and Trudeau governments appear to be particularly raw, and especially so this week. On Tuesday, federal Conservative Leader Andrew Scheer visited Queen’s Park and was warmly greeted by the premier as the “next prime minister of Canada” — a development that would come, Ford said at a photo op in his office, after voters “get rid” of Trudeau in next year’s election. Meanwhile, federal Immigration Minister Ahmed Hussen was accused once again this week of giving the back of the hand to his Ontario counterpart, Lisa MacLeod. MacLeod responded on Twitter that Hussen was a “name-calling bully.” That charge also isn’t new — the two ministers have been sparring almost since the Ford government came to office last summer. Trudeau’s labour minister, Patty Hajdu, was also plunging into the fray this week, announcing a wave of new worker protections very similar to the ones that have recently been rolled back by the Ford government. Hajdu spoke out against what she called the “politics of cruelty” and the “devastating” spectacle of governments rolling back worker benefits. There is plenty of cross-pollination between partisans in Queen’s Park and Ottawa at present. Trudeau’s government has been built around strong connections to Ontario Liberals. His two chief advisers, Gerald Butts and Katie Telford, are veterans of the old McGuinty government. Ford’s new government, similarly, has been drawing on a raft of staff connections to the old Harper regime, including Jenni Byrne, who served as Harper’s campaign manager and deputy chief of staff, and is now installed in the premier’s office. What has happened over the last couple of weeks offers a peek into the 2019 election. In Ontario, things will get mean. Ford and his thugs are using the dtrump approach to politics. It has worked well for dtrump so I'm sure Ford thinks it will work for him. Telling people refugees are taking up substantial space in homeless shelters doesn't even make sense. Refugees are sponsored either by private groups or the government and as such are in receipt of incomes. Now it may be that former refugees, may be in shelters, but certainly not here in B.C. Not knowing much about Toronto and their shelters, I think I can say without hesitation that the Ontario politician has their facts mixed up, but when have these types of politicians ever let the truth stand in their way. The other thing that one ought not to forget is that Gordon Campbell, former Premier of B.C., is Ford's advisor and Campbell is oh so good at the tell a big lie long enough some people will start to believe it. Campbell, lied and lied and lied until his own party finally threw him out of his position. Get ready for a lot more lies while el gordo is Ford's "advisor". Campbell set the template for these guys, e.a.f. For them, Truth is not sacred. Exhibit A is the size of the deficit. What's The World To Do?